What is Okonomiyaki? (お好み焼き) It's a traditional Japanese food that is sometimes called "Japanese Pancake" or "Japanese Pizza". It's a savory dish that is a bit more like an omelette or frittata than a pancake and it's made with okonomiyaki flour, eggs, cabbage, pork (bacon), shrimp or other seafood, and topped with a variety of condiments like sweet sauce (Okonomi Sauce), mayonnaise, dried seaweed and dried fish flakes. Now... that may not sound very appetizing, but it turns out to be an INCREDIBLY DELICIOUS dish - crispy on the outside and soft inside. What could be better than Japanese food plus Bacon? If you have a passion for food, you absolutely must try Okonomiyaki! One typically finds this amazing food at specialized Okonomiyaki-ya restaurants and street vendors in Japan. There are over 30,000 restaurants in Japan that serve Okonomi-yaki, but only a hundred or so outside of Japan, so if you do see it somewhere, give it a try! 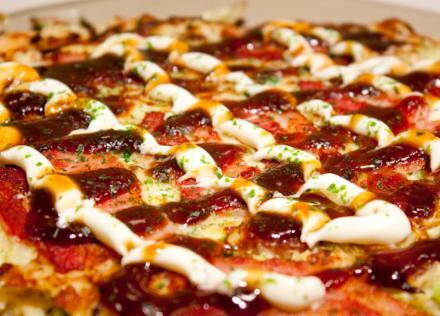 Here is a list of restaurants where you can try Okonomiyaki. 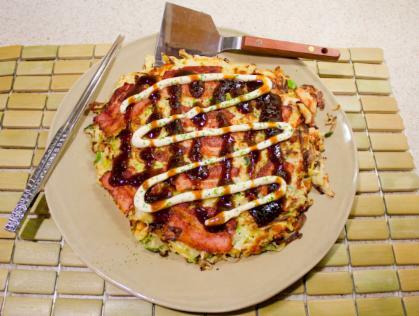 But, don't worry, it's easy to make Okonomiyaki at home by following the instructions for the Best Okonomiyaki Recipe. Since Okonomi means "as you like it", there really is no single best recipe. There is a lot of creativity involved and many different variations on the recipes. And if you can't get Japanese groceries locally, you can buy Okonomiyaki ingredients online at our Okonomiyaki shop. Whether you spell it Okonomiyaki, Okonomi-Yaki or Okonomiyake, of all the Japanese foods this is our favorite and we are excited to share the joy of this wonderful dish and the Best Okonomiyaki Recipe. At this site you can also learn more details about Okonomiyaki ingredients and substitutes, the history and different types of Okonomiyaki (Kansai or Osaka style shown here, or Hiroshima layered style), Okonomiyaki restaurants outside of Japan, and buy Okonomiyaki ingredients. Kansai or Osaka Style Okonomiyaki.